MAKE AHEAD TIPS, STEP BY STEP PHOTOS and VIDEO below! It’s almost that time, friends. Less than one month until the big, huge THANKSGIVING feast! I know it seems early to start thinking about Thanksgiving, but the truth is, if we get our ducks (er, turkeys?) in a row we can actually enjoy the holiday. Yes, Thanksgiving can be stress-free! Check out all my make-ahead tips and recipe ideas below. I have loads of tried and true recipes to get you through the holidays (scroll down for more). You are currently looking at my MOST POPULAR RECIPE. 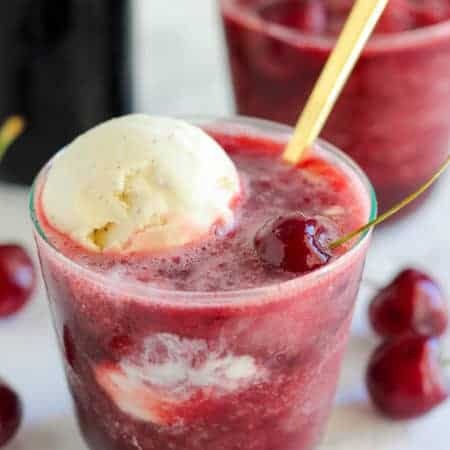 It is a long-standing reader favorite, as well as a family favorite. And if there’s one thing I can guarantee you, it is that any Thanksgiving I am hosting will always, always include this Sweet Potato Casserole. 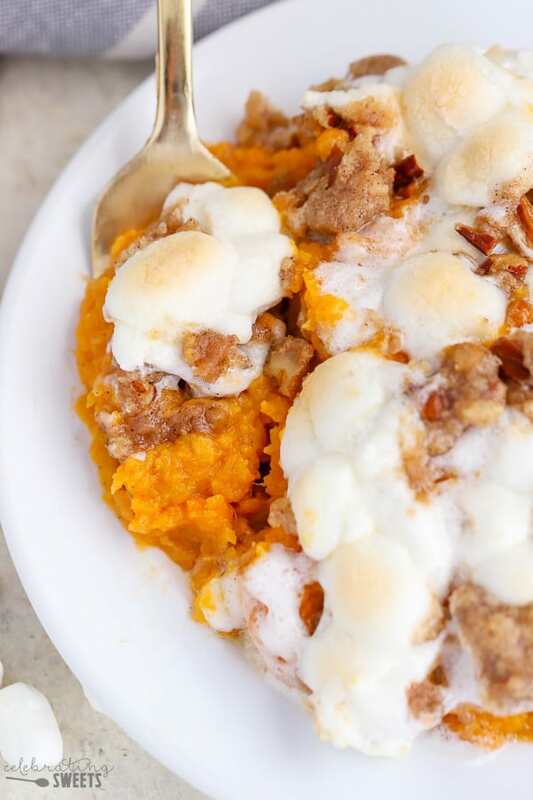 This is THE BEST Sweet Potato Casserole ever. 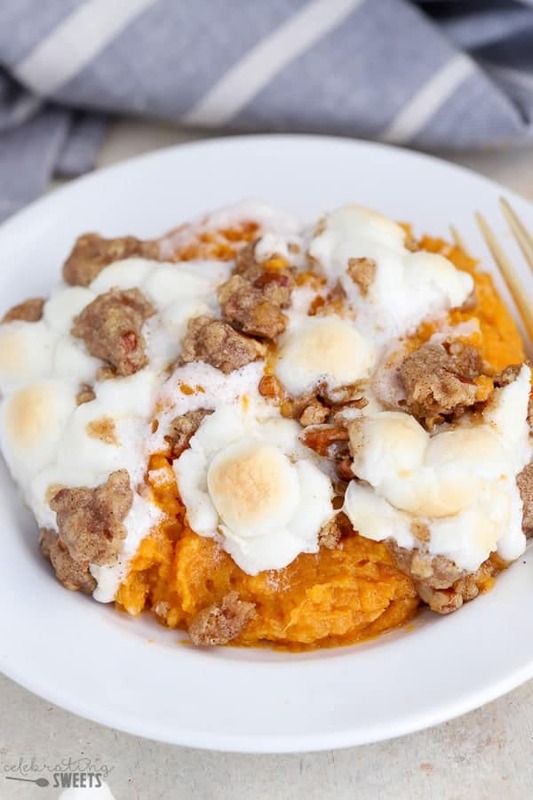 Flavorful sweet potatoes topped with toasted marshmallows and a brown sugar streusel. Sweet and salty, crunchy and creamy – this is the perfect side dish for your holiday meal! This dish is a fantastic side dish for any holiday. It’s simple, yet the payoff is huge! Everyone goes crazy for it – trust me! Start by Making the Mashed Sweet Potatoes: Peel and cut sweet potatoes. Place in a pot and cover with water. Bring to a boil, and boil until tender. Drain and mash. Keep them chunky or mash them completely smooth – your choice. Season the Mashed Sweet Potatoes: Butter, milk, cinnamon, brown sugar, and salt take these potatoes over the top. Adjust these seasonings to suit your taste. Sneak a few bites and see what you think. Transfer the mashed sweet potatoes to a greased casserole dish. Brown Sugar Streusel: Mix up a quick topping of flour, brown sugar, pecans, cinnamon, salt, and softened butter. This is what takes this recipe over the top! Sweet, salty, buttery, crunchy bites that get distributed all over the sweet potatoes. 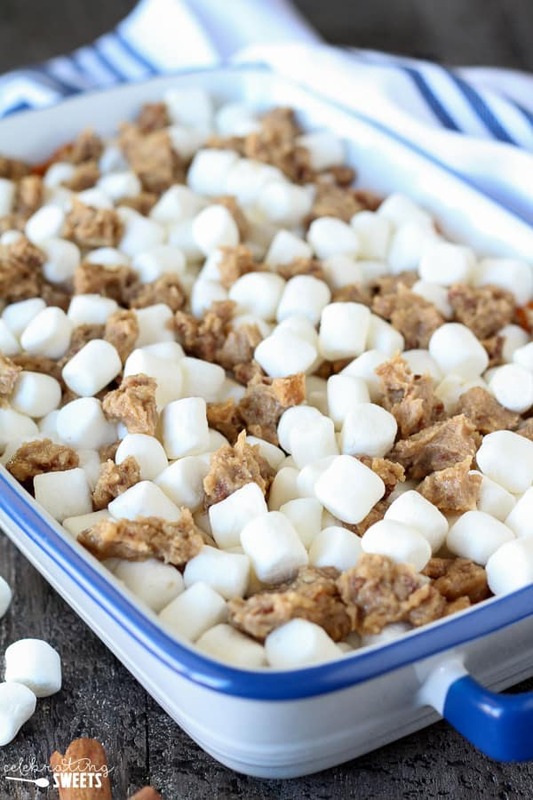 Marshmallows: The classic sweet potato casserole topping! Scatter mini marshmallows all over the top of the potatoes. Then drop bits of streusel topping over the marshmallows. Bake It: 10-15 minutes in the oven is all this needs. Just enough to get the potatoes hot, the marshmallows toasted, and the streusel set. 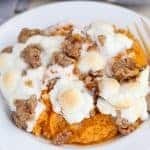 This dish is the perfect way to satisfy the traditionalists who have to have the marshmallow topping on their sweet potato casserole, yet the streusel adds something extra for those who want to switch things up. If you’ve never had this dish before, I know it might sound strange, but trust me, it totally works! 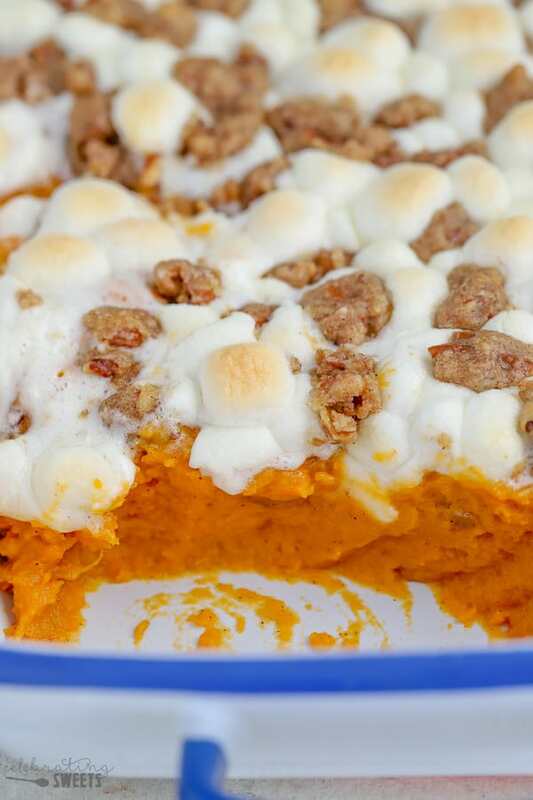 Those toasty-gooey marshmallows really do make the sweet potatoes taste even better. Plus, this is a fun holiday side dish, and nothing says fun like eating marshmallows with your dinner. How long you leave this in the oven will determine how toasted your marshmallows will be. 8-10 minutes will give you lightly toasted marshmallows and 10-15 minutes will make them darker. 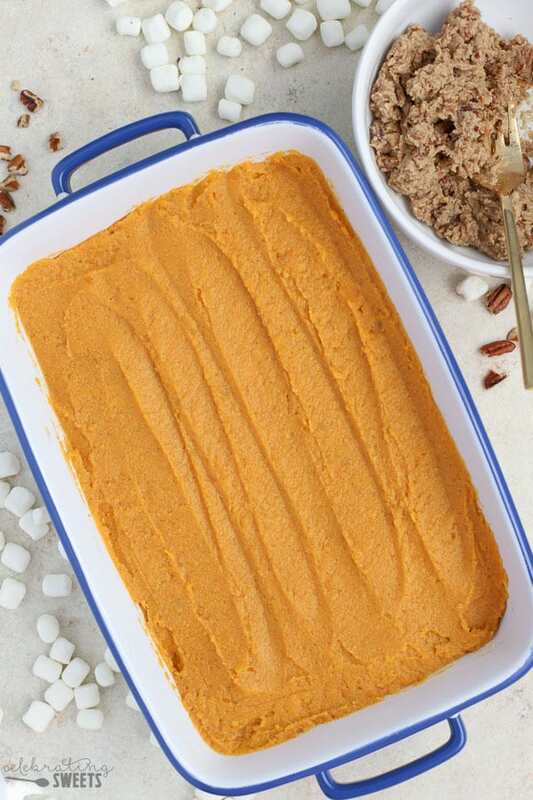 Assemble the cooked and seasoned mashed sweet potatoes in a casserole dish and refrigerate tightly covered for up to 2 days (without any topping). Prepare the streusel topping (without the marshmallows) and refrigerate that separately. Before serving, bring the streusel topping to room temperature. Heat the potatoes (without any topping) in the oven until heated all the way through (30-ish minutes depending on the size of your casserole dish). Once the potatoes are warm, sprinkle on the marshmallows and streusel and return to the oven for 10-15 minutes, until the marshmallows are toasted. 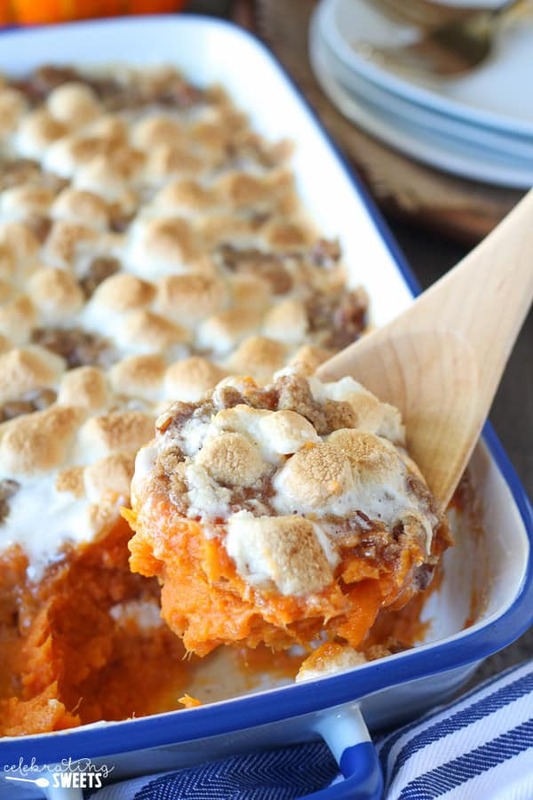 Can You Use Canned Yams for This Sweet Potato Casserole? Use two and a half to three 29-oz cans of cut yams (this will vary based on the casserole dish you use). My recipe calls for milk to be added to the yams. You may be able to omit the milk completely. The yams will already be quite wet, and you don’t want them to be runny. Mash the canned potatoes along with butter, cinnamon and salt as the recipe instructs. Taste them. If you’d like them sweeter, add up to 2 tablespoons of brown sugar. Most canned yams come packed in syrup, so they are already sweet. Continue with the recipe at step 3. 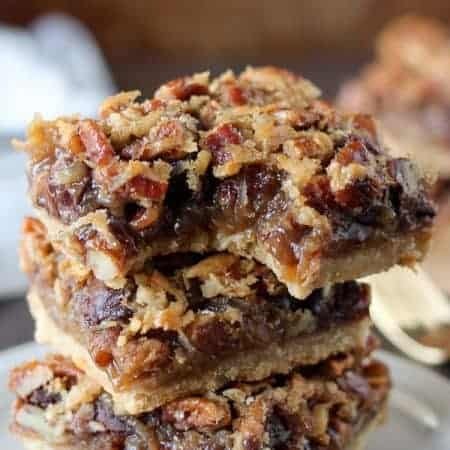 MAPLE PECAN PIE BARS: Brown sugar shortbread crust and a gooey maple pecan filling. Sweet, salty, crunchy, chewy – absolutely addicting! APPLE CIDER CRANBERRY SAUCE: Easy homemade cranberry sauce flavored with fresh apple, apple cider and maple syrup. CREAM CHEESE PUMPKIN PIE: A graham cracker crust filled with a no-bake pumpkin cream cheese filling and topped with freshly whipped cream. APPLE CRUMB BARS: A brown sugar oat crust filled with cinnamon spiced apples and topped with salted caramel sauce. CREAMY CHEESY SLOW COOKER POTATOES: Slow cooked potatoes loaded with sour cream, cheddar cheese, and a secret ingredient. CINNAMON VANILLA HONEY BUTTER: Elevate rolls, bread and biscuits with this super easy and unbelievably delicious flavored butter. 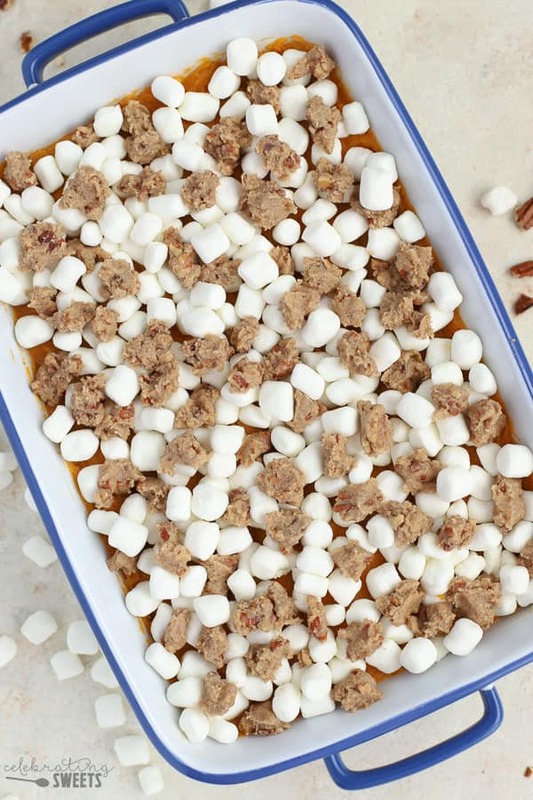 Mashed sweet potato casserole topped with toasted marshmallows and a brown sugar-cinnamon-pecan streusel. The perfect side dish for Thanksgiving or any other holiday celebration. Preheat oven to 375°F. Grease a 2 or 2 1/2 quart casserole dish and set aside. Place the sweet potatoes in a large pot, cover with water, and boil until tender (about 7 minutes, depending on the size). Drain and return to the pot. Add butter, milk, cinnamon, brown sugar and salt to the potatoes and mash until smooth. Use a hand mixer, if desired, to make them extra smooth. Taste the potatoes and add additional seasonings, if desired. Transfer the mashed potatoes to the prepared casserole dish. Place in the oven until heated through (if they're warm it will only take a few minutes). While the sweet potatoes are heating, prepare the topping. 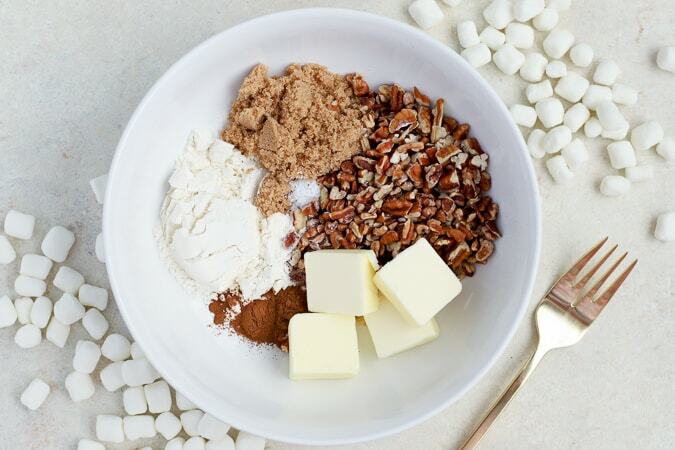 In a medium bowl, combine butter, brown sugar, flour, cinnamon, salt, and pecans. Stir until thoroughly combined. Remove the sweet potatoes from the oven. Top with half the marshmallows, then sprinkle half the streusel over the marshmallows. Top with the other half of the marshmallows and sprinkle the remaining streusel over the top. Place back into the oven for 8-15 minutes, until the topping is bubbly and brown (keep an eye on it so the marshmallows don't burn). You can also place it under the broiler very briefly to add a little more color to the marshmallows. *Some grocery stores might have these potatoes labeled as YAMS. Make sure you purchase sweet potatoes/yams with orange flesh and pinkish brown skin. Scrape the skin a little to see the color of the flesh, if necessary. - You can assemble the cooked and seasoned mashed sweet potatoes in a casserole dish and refrigerate tightly covered for 2 days (without any topping). - You can also prepare the streusel topping (without the marshmallows) and refrigerate that separately. - Before serving, bring the streusel topping to room temperature. Heat the potatoes (without any topping) in the oven until heated all the way through (30-ish minutes depending on the size of your casserole dish. Or speed it along by microwaving). 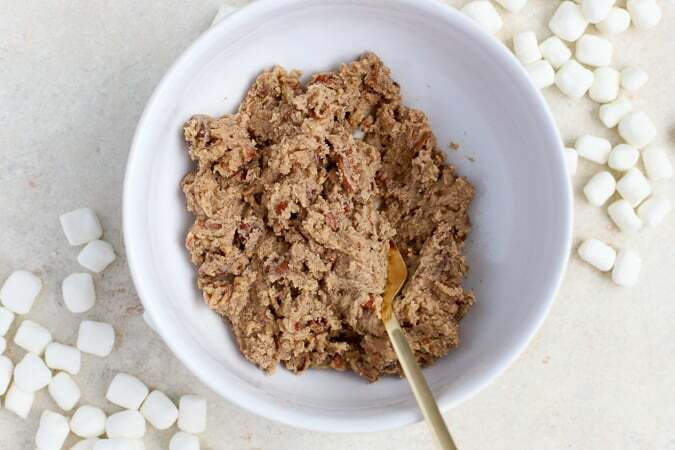 Once the potatoes are warmed through, sprinkle on the marshmallows and streusel and return to the oven for 10-15 minutes, until the marshmallows are toasted. See tips in the post about using CANNED YAMS. The potatoes shouldn’t have been soupy unless you added too much milk, didn’t drain them well, or used canned yams, which have more liquid than fresh. 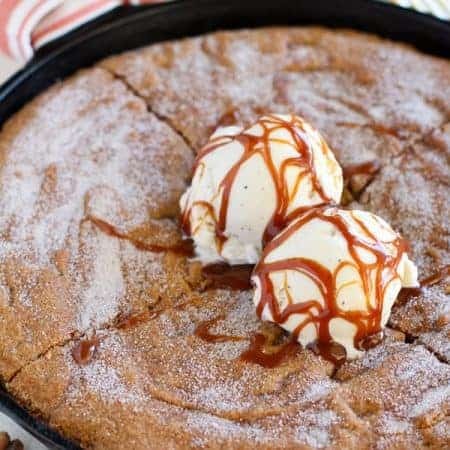 The topping can get a little bit runny if you leave it in the oven for too long, or if the brand of marshmallows you use melt too quickly in the oven. I’m glad you enjoyed it! The pineapple sounds delicious! Thanks for stopping by. 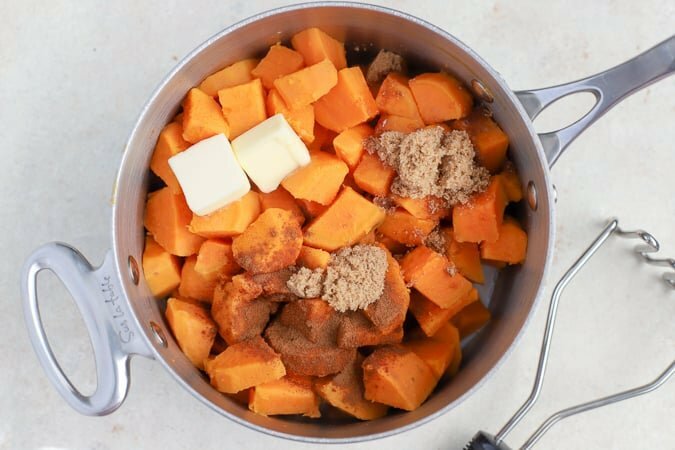 Was disappointed in this recipe in both taste and texture…I measured everything out and would definitely eliminate some of the milk as the sweet potatoes were definitely too wet. Sorry to hear that. Sometimes the topping can be wet (if the marshmallows melt too much), but I’ve never had trouble with the potatoes being wet. If you used canned yams, or didn’t drain the fresh yams enough that might have contributed to the extra moisture. I’m glad to hear that! Thanks for taking the time to come back and comment. I appreciate it! I want to make this for an office party. How can i do it the night before and still be yummy for the next day? Hi! Make ahead instructions are in the recipe card as well as the blog post itself. It’s very easy to prep ahead. Enjoy! I made this for my first sweet potato casserole ever and my family wiped it out! Thanks so much for great and yummy recipe. Made this for Thanksgiving. My husband’s family has advised me that I must make this for every family gathering now. I’m so happy to hear that! Thanks for taking the time to comment. Happy holidays! Idea as to what a serving size would be? I’m guessing 1/4 cup as a side dish ? Yes, I would guess about 1/4 cup, as long as there are other side dishes along with it. This looks amazing and I’m looking forward to trying it! My only concern is timing, because I’ll be cooking several dishes at once. For the reheating process if you prep the potatoes ahead, do you have a general idea of how long it takes to warm them up? I’m thinking of heating it up at 350 in the oven with some of my other side dishes before “cooking” it at 375. It will take 30-40 minutes or so to heat up, depending on the size of your casserole dish. Enjoy!